Love the pier for fishing. Wish there were more of these up there. They are great for my husband who uses a wheelchair. Small beach but not crowded, just a few stairs from the parking lot down to the beach. Very fine sand. And the best part: at the top of the stairs are several benches where you can sit and watch the boats or just enjoy staring at the ocean without having to cart all the beach equipment along. 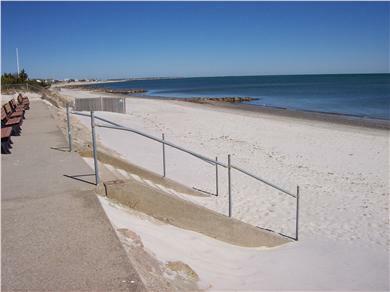 This is a beach within walking distance [Property ID 20751]. There a lifeguards on duty and you are just a short beach walk away from bathrooms at Parkers River Beach. The beach is clean and has plenty of room to spread out at high or low tide. This beach was the largest and least crowded of the ones we visited. It also provided the best walking. More quiet and less crowed than other beaches. Only 1st week in June and 2 August summer weeks left! Off season early October still available! Distance to beach: Steps from the front door! Just Beachy - Central AC & 2 min walk to the beach !